Did Shabari actually feed Ram ‘tasted’ berries? The idea probably came from 15th century Odia poet Balaram Das, who challenged Brahmanical orthodoxy in his writings. In a recent TV show, the story of Shabari, the aged tribal devotee of Ram, was retold. In it, she feeds Ram grapes, not berries. This upset a lot of people, who felt too many liberties were being taken by the channel. There were complaints on Twitter and sarcastic comments on Facebook. What most people do not realise is that the story of Shabari has gone through dramatic changes in the past 2,000 years. The tale of her feeding Ram berries, and that too after "tasting" them, is probably only about 300 years old, at best 500, which is short considering the vast history of the Ramayana. There is no reference to this either in the 2,000-year-old Sanskrit Valmiki Ramayana or the 500-year-old Awadhi Tulsidas Ramacharitmanas. In all probability, the idea of Shabari serving "tasted" fruit came from an Odia poet, Balaram Das, who lived in the 15th century, identified himself as Shudra-muni, and challenged Brahmanical orthodoxy in his writings. Let us trace the history of Shabari’s story: Two thousand years ago in Sanskrit Valmiki Ramayana: as Ram goes deep into the forest, in search of Sita, he encounters near Lake Pampa, a woman called Shabari, servant of sage Matanga. Matanga has long since gone, and Shabari alone watches over the hermitage, waiting for Ram as prophesised by her master. When Ram arrives, his presence overwhelms her. She touches his feet, feeds him fruit that grows in abundance in the neighbourhood, and after he expresses satisfaction with the meal, immolates herself to join her teacher in heaven. There is no comment on the social status of Shabari, but we suspect she is of lower station as normally Ram touches the feet of ascetics, but here it is she who touches his feet. Also, in Mahabharata, and in Buddhist lore, Matanga is described as a low-caste sage. Thus, there are allusions to lower station, but nothing about berries, or "tasted" berries. Shabari and Ram statues at Simhachalam, Andhra Pradesh. A thousand years ago, Tamil Kamban Ramayana referred to Shabari as an ascetic and devotee who sheds tears when she sees Ram and gives them whatever they want. No mention of fruit, or "tasting". Seven hundred years ago in Telugu Ranganatha Ramayana there is a reference to offering fruit, but no details about the fruit, and no "tasting". Six hundred years ago in Sanskrit Adhyatma Ramayana, Shabari literally does puja of Ram and declares her unworthiness on account of her low station, but Ram tells her that station does not matter. She immolates herself and is liberated, despite being of "low" birth. Five hundred years ago in Awadhi Tulsi Ramayana, which is influenced by the Adhyatma Ramayana, Shabari falls at Ram’s feet, sheds tears of love, speaks of her low status on account of gender and birth, offers fruits and tubers and finally reaches the heaven of Vishnu (rather than simply being liberated) indicating a very clear entrenchment of Vaishnava mythology. So basically, where did the story of Shabari serving "jhoota ber" come from? Around the same time as Tulsidas wrote his Ramayana, Balaram Das wrote his Odia Dandi Ramayana. Here we find the story of how Ram encounters Shabari and she scours the forest to find sweet mango for him. He eats those with "teeth marks" indicating they have been tasted and rejects those without teeth marks. This is probably the first time we get the story of "tasted" or "saliva-soiled" fruits being served to Ram that he accepts. In traditional societies, food that is tasted is soiled and so cannot be eaten by members of the upper caste. By eating soiled food, Ram indicates how he does not care for caste hierarchy. In this story, there is no reference to sage Matanga. Shabari/Shabarani and Shabara, a tribal couple, meet Ram and they are informed of this imminent arrival by Indra. Shabari is a common noun here, not a proper noun. That such a story would be written by Balaram Das is understandable as he was part of the Pancha-sakha group in 15th century Puri, Odisha, who challenged Brahmanical customs and identified themselves as Shudra-munis (low caste sages). There are suggestions that he was probably inspired by a south Indian Sanskrit hagiography of saints known as Divya-Suri-Charitham, but the story did not gain popularity as the Brahmin orthodoxy found the story too radical. Puri, Odisha, is known for its association with Savaras or tribes. The temple of Jagannath was originally established by Savaras and they continue to play a role in temple rituals, one of which probably once involved serving the lord tasted fruit (a practice vehemently denied by Brahmin priests today), during his annual "sickness" before the famous chariot festival. We sense a tension here between the more conservative and liberal arms of Hinduism - one that has clearly existed for centuries. So in all likelihood, the story of Shabari serving "tasted" food to Ram comes from Odisha. Sundari Mangoes with maroon blush. 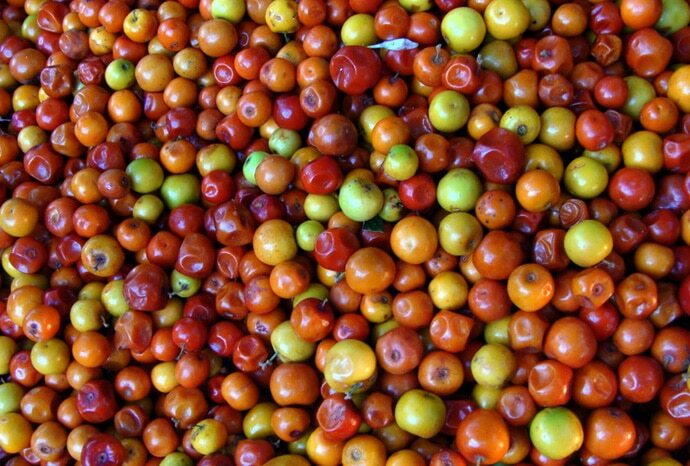 The fruit transforms from mango to ber (jujubes) two centuries later, in the Gangetic plain. 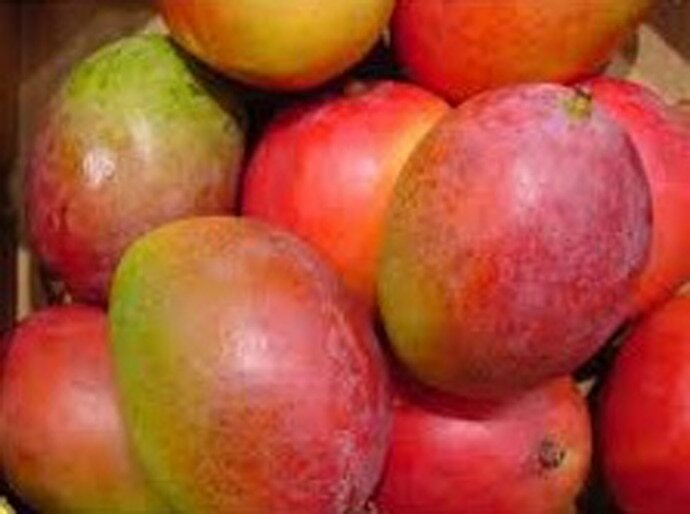 Significantly, Balaram Das describes the mango served as "Sundari", a variety of mango that has a maroon blush, the same colour as jujubes. Three hundred years ago in Bhakti-ras-bodhini by Priyadas written in Braj-bhasa elaborates on the lives of Vaishnava saints and here he refers to the story of Shabari in detail, how she is treated as an untouchable low caste by the ascetics near Lake Pampa, despite being accepted by the guru Matanga, and how Ram eats the berries that she has already tasted and considers her the fortunate one. Berries, or jujubes, traditionally associated with Shabari. Priyadas captures the version that is now part of popular imagination. Here three elements are clearly merged: the low social status of Shabari, the identification of the fruits served as berries or jujubes, and that they were consumed by Ram even though she had "tasted" them, made them "jhoota", a major caste taboo in Hinduism. An additional element, downplayed nowadays, is the abuse of Shabari by Matanga’s students, who though hermits are unable to shed their caste consciousness. In the last century, Shabari story was made popular in the magazine Kalyan by Gita Press Gorakhpur, which was owned by two Marwari brothers, and whose writers and editors were often Brahmins. In essays and commentaries since, elaborate stories have emerged to clarify that Shabari was vegetarian and that she ran away from her family that wanted to slaughter animals for her marriage. Her becoming vegetarian compensated for her low tribal (bhil/savara/kirata) status, which was reinforced by jujubes or the ber she served Ram. She came to be considered "mad with devotion", preparing to welcome Ram by decorating the ashram with flowers for years, on instructions of her guru who had prophetic visions, long before Ram actually arrived. 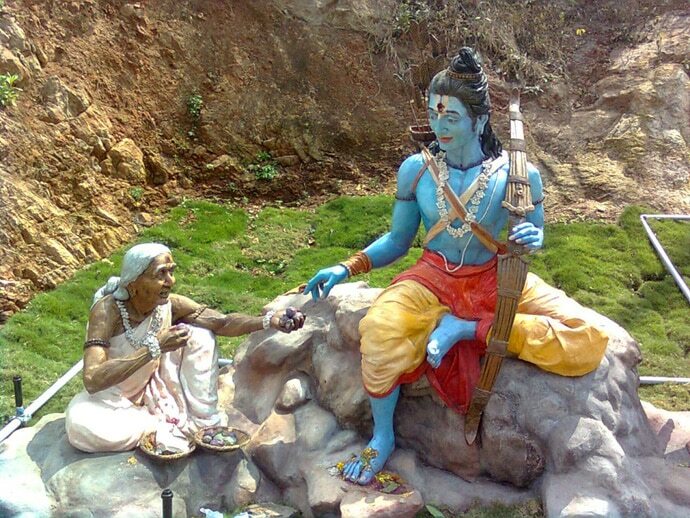 Lakshman gets upset watching Shabari feed Ram soiled berries and Ram admonishes him and speaks of how love and devotion are more important than rules of caste and hierarchy. It is this version of Shabari that the Sagar Ramayana of the 1980s etched in public memory with his TV show. And saw a Sabara and Sabari on their way. They noticed in front of them. He asked him his clan, lineage. And I've come to stay in these forests, of my father's order." Searching for her have I come this place." She took Rama & Lakshmana to her home. Giving him the hide of a black antelope as a seat. She said, "O Raghunatha, Listen O! The god Indra sent for me, said me so. Relish them, o one of Raghu root." Saying so did Sabari lay those before. You have saved the best, aware of time", so he praised. "Bring, o bring, your beautiful fruits. Let my hunger be satiated by your grace." And happily did he eat them. Taking one in his hand, he threw it to the ground. the one who blesses his servants. Who can tell his grace, infinite? Now listen forth, how the Sabarani arranged for the mangoes. She entered the chuta-vana (Mango forest), gathering mangoes. Abandoning the bad, she collected the good. So did she bring them all together. Eating a portion, did she know the good and bad. Leaving apart a Sundari mango, without biting into it. And this thought did fill her heart. Those mangoes that had an imprint of her teeth. Finding it bereft of any marks. Why else would I leave a good one apart?" "How did you come to know of its taste? If it is good indeed, why did you not taste the fruit? Do not serve me untasted food. For if I eat this, will I not contradict myself? I found that they tasted great. I shall not consume this unmarked food." Saying so, he stood up from his seat. Lakshmana alone ate the ripe food.